To discuss any aspect of the garden, contact them by email. At Bundoora Park, 1069 Plenty Road, Bundoora. 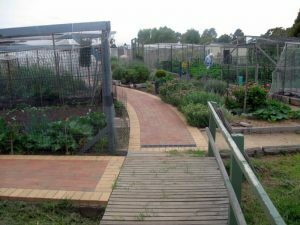 The garden is located within the Bundoora Park Farm. Within the farm, there is a fruit orchard including an urban farm with chooks and bees. The farm also supplies tools, water and manure. There are garden plots available for rent to the general public. Annual fees are $79 for a raised plot and $105 for a standard plot. There is a waiting list for these plots.